The best know attraction in Copenhagen - The Little Mermaid - cannot be seen in Copenhagen in the summer of 2010. The little sculpture will for six months be part of the Danish pavilion at the World Exhibition EXPO 2010. 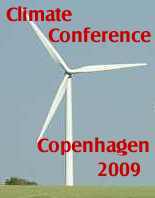 After the conference on climate changes in Bali in December the Danish government is preparing for the next conference in Copenhagen 2009. The goal for the conference is an global agreement making it possible to sign a Copenhagen Protocol to replace the Kyoto Protocol which runs out in 2012. Sunday the 1st of July the crown prince Frederik and the crown princess Mary of Denmark will let their daughter be christened. 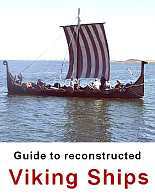 The ceremony will take place in the church of Fredensborg Palace in North Zealand north of Copenhagen. The princess was born at the 21st of April this year. There is a tradition in Denmark of not announcing the name bore christening. The princess is the second child of prince Frederik. 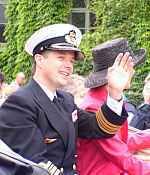 Prince Frederik himself is the oldest son of queen Margrethe 2nd and therefor is expected to be King of Denmark after her. 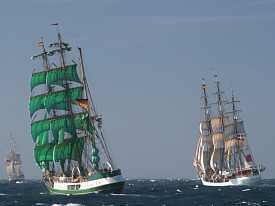 Alexander von Humboldt (left) and Danmark (right) are among the Ships in Aarhus in July. Photo: Photo: Sail Training International. 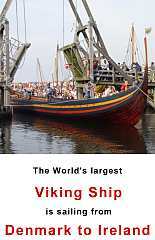 The big race for large sailing ships will in 2007 reach the city of Aarhus. Erantis is a guide to information to culture, environment and life. The media is under development. Please visit this page later for more information.